Walking through the South Lake Union neighborhood the other night had me caught up in thoughts of the city and my life in the midst of it. I drove up here at 18 in a VW Karmann Ghia, fresh from heartbreak in the desert and searching for an old friend and a place that was nowhere id been. All that I’d heard about Seattle was flannel shirt music and a Rolling Stone article that highlighted suicide, heroin, and the insidious gloom. To me it felt a dark and gritty place where people came to jump off into the unimaginable frontiers of Alaska, Canada, and the wide open Pacific. That first day the city was in perfect dreary November clothes, and I slept on the couch of a friend of a friend of a friend. Actually, the v-berth of a sailboat moored along the ship canal in Ballard. Fate tripped up my aimless wandering and the raindrops talked me into staying. I promptly got an unmentionable piercing, a job making coffee, and fell for the sailor. Now, back on the wide bright streets of the newly transformed heart of the city, the lights on the Vulcan cranes wink at me and the lake sparkles all around the edges. Did all that grit and grunge grow up, have kids, and move back to Ballard? 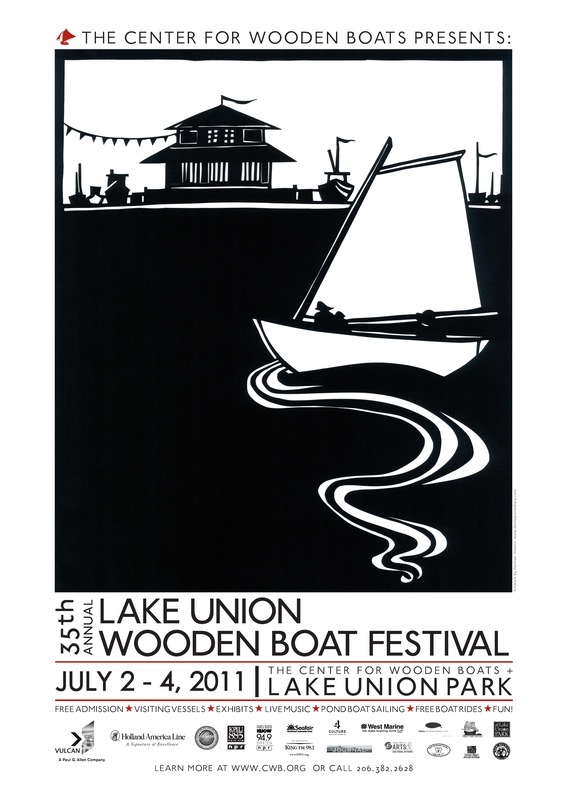 This nostalgia is due to recent sightings of the new Center for Wooden Boats festival poster which features one of my papercuts. I love it, partly because Erin at the Center did such a great job of layout, but also because it feels like I’m celebrating my time in this place, in and around Seattle, its boats and characters helping and holding me as we both change and grow. Your art for this event is nothing short of amazing, gorgeous, evocative, and brilliant. I plan to buy a signed poster and have it framed. Thank you for creating this work!